Things didn't quite pan out as Swansea had hoped when taking on a stubborn Everton last Saturday. The 2-0 loss goes to show that... well, Swansea can't win them all (I think, deep down, we already knew that). Onto Sunday and Swansea City, with accompanying Jack Army, will travel the simple journey to London to play a not-so-simple match against Harry Redknapp's side (hopefully not soon to be Brendan Rodgers' side as the media like to suggest!). Swansea shared the points with Spurs at the Liberty Stadium back in December in a thrilling encounter that felt more like a win for Swansea. So we know it's not an impossible task – when you beat Man City, nothing seems an impossible task I guess – but we do know it'll be a tough one. There are two key changes to the Swans squad this weekend, the first being a big blow in not having Spurs loanee Steven Caulker available, due to the terms of his loan. Garry Monk should slip back into the squad and do an equally fine job, but there'll be aspects of Caulker's game we will miss, especially in the air. A more positive change is the return of Nathan Dyer after his three-match suspension. He'll be fit, fresh and dying for a game, but would his inclusion mean a place on the bench for Wayne Routledge? Routledge has been superb recently with three assists in the last two games that Swansea have won and it would be harsh to drop him. The other option is to leave out Scott Sinclair who hasn't had the greatest of seasons so far. However, I feel it's more likely that Routledge will sit this one out. Spurs are currently fourth in the Premier League table and are looking likely to play Champions League football next season, despite a recent dip in form (they have failed to win in their last four league matches). Aaron Lennon is likely to make and appearance after four matches out with a hamstring injury, which will be a boost to the home side, but they're likely to miss Ledley King and long-term absentees Michael Dawson and Heurelho Gomes. Swansea gave us one of our toughest games this season, when we drew 1-1 at the Liberty Stadium. I knew that Swansea had a reputation for playing attractive possession football in the lower divisions, but I've been astonished at how successful it's proved in the top flight. Most promoted teams who try to play good football go straight down, but Swansea seem to have a tough core and defend well. It's been great to see how Steven Caulker has done at Swansea and although I don't agree with the rule that on-loan players can't play against the club that owns them, I hope you miss him on Sunday. After a difficult time, we've maybe turned a corner with our results against Chelsea and Bolton. I'm expecting us to create loads of chances, miss most of them and struggle to a 1-0 win. Despite Swansea having the option of Dyer back and Premier League survival all but guaranteed, I can't confidently predict a win for Swansea down to the inconsistency on the road. I'm feeling a repeat of December could be in store though, so I'll predict an entertaining 1-1 (at 7/1 on PaddyPower). Dan's prediction of a 1-0 win to Spurs is at 5/1. Check out my preview for UniBet.com, where I go head to head with a Spurs fan to give my take on Sunday's game. Swansea City vs Everton: Safety matches! The notion of “safety” in the Premier League seems a little irrelevant when Swansea City comfortably hold eighth position in the table. Even so, the mathematicians among you (which, I suspect, is not that many) will want the added feeling of security that 40 points will bring and a win in Saturday's game against Everton will push Swansea into the desired “safe” zone. Nathan Dyer will be serving the last of his three-match ban for his red card at Wigan, leaving Wayne Routledge to once again fill in on the right wing. I guess “fill in” undermines him slightly as he's done so much more than just fill a hole. While arguably less skilful and certainly less speedy than Dyer, Routledge's delivery into the box has been superb and it's something that is definitely leading to goals. Gylfi Sigurdsson is having an inspired few weeks and I wouldn't bet against him getting another goal or two in the game against Everton. He's certainly the player to permanently fill the Dobbie-role (now on loan to Blackpool until the end of the season) – if Swansea can raise the funds to sign him. Ashley Williams is still not a certainty to start after missing out at Fulham due to sickness last weekend. We hope he returns, but I'm sure Monk would relish another starting appearance (and probably deserves it). Before we get too caught up in getting the fourth win in a row, lest we forget Everton are still a “big” team. Despite now being below the Swans in the table (tenth), they're consistently a top-ten side and boast a number of impressive players and a good manager in Moyes. Everton took all three points from Swansea in Goodison Park at Christmas time with a 1-0 win, but were unable to overtake the Swans in the table on Wednesday, when they lost 1-0 to Arsenal. In fact the Arsenal game marked the third in a row without a win, so they'll see Swansea as a route back to winning ways. I'm sure they'll be wary though – I don't think any team now feels Swansea is an easy three points, especially at the Liberty Stadium. Brendan Rodgers has rightly been lauded for the way Swansea have lightened up the top flight. The best thing about your style is that it shows you don’t have to play the direct, dour percentage football adopted by other sides that have come up. Against a side who keeps the ball like you guys do there is perhaps a plan A and Plan B. ‘Plan A’ is to let you have the ball, conserve energy by only pressing when you approach 20 yards from our goal. Plan B is to stop you playing from the back. Given the small squad and the vital cup replay on Tuesday I’d doubt very much if Moyes would adopt an energy sapping tactic like Plan B and will instead adopt Plan A and look to stand off, narrow the passing angles to Swansea’s defenders and push them to play longer. Moyes will certainly shuffle his pack for this one given the Arsenal game last night and the cup game next Tuesday. I’d expect Stracquilarsi, Anichebe and perhaps Gueye to get run outs given they all have good energy as we will probably spend a lot of time not in possession. Pienaar is cup tied for Tuesday so will probably start also. I’d imagine Cahill, Jelavic and possibly Drenthe will all be rested. Our goal scoring record on the road is awful – less than one per game – so you probably only need the one goal to win it! Swansea are favourites at 5/4 so would be a good inclusion in any accumulator you have going this weekend. 'Sigurdsson to score first' is at 13/2 and probably worth covering as he is the man on fire at the moment. My score prediction is 2-1 to Swansea, which is priced at 15/2. Nic says just one goal could win it for Swansea, and 1-0 to the home side is at 11/2 (all odds from PaddyPower)! Thanks again to Nic and be sure to check out The Executioner's Bong for more analysis! Swansea? In Europe? Yes, I recall being laughed out of various forums/blogs at the beginning of the season for suggesting that Swansea City may end up in Europe. I was talking optimistically of course, and actually meant “it may happen in a few years”. But it could well be a reality next season. While it's highly doubtful (yet not impossible) that Swansea will qualify for the Europa League next season by table position, they have another route. As we speak (well, as I type and you read a few hours later) Swansea sit second in the Premier League Fair Play Table, just below Spurs. As you might be aware, Swansea were leading the race for first up until a few weeks ago. But there is ample opportunity to claim top spot again, and you can help with this. The Fair Play competition is not just about red and yellow cards gained, it covers many aspects of promoting the "beautiful game", including positive play, respect towards opponents, respect towards the referee and – where you come in – behaviour of the public. The full details of how the Fair Play scores are calculated can be found here. The rules are basically encouraging the public to "verbally support their team in acceptable form" (I think Hymns and Arias has helped Swansea to no end this season!) and to also “covert recognition of outstanding play by the opponents”, which means applauding when, say, Heskey scores an overhead kick. So think carefully next time you decide to remind the referee he is a wanker (even though he may well seem it). At the end of May, even if Swansea don't top the Fair Play table, they may be able to gain access to Europe depending on who is above them (if it's Man United, Spurs, etc, chances are they will already have a spot, so Swansea will automatically qualify). There is another league controlling entry to the Europa League however, so this will all be obsolete if the English Premier League does not finish in the top three of the overall country league (it's getting confusing now). As it stands the EPL would not be given a fair play place as it sits eighth in the league. Here is a little more reading on the subject, along with the current table – definitely something to keep an eye on in the coming weeks. So how will Swansea fare in Europe? There are negatives such as squad size and a dent in finances to balance the prestige of playing with the likes of Napoli, Udinese, Bayer Leverkusen, Levante, and so on, but we'll cover that if Swansea do get there! 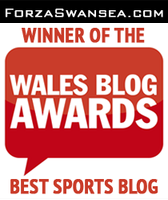 Remember to check me out on Twitter @ForzaSwansea for blog updates and general Swans discussion! With the Wigan game on the way this Saturday it has just occurred to me that I've not heard any Swans fan - online or otherwise - mention “getting one over on Martinez”. It's actually refreshing to concentrate on the game in the wider scheme of things instead of it being headlined as a match to show the former boss what he's been missing. Chances are he already knows what he's missing! Despite a more mature approach to this game by the fans - a sign of how far Swansea have come this season - the same question is there for a different reason: is this a must-win game? I put this question out on Twitter last week and the response was mixed. Some say it is, some say it isn't. Some don't know. Perhaps the best response was: “It's not a must-win game, but it is a must-not-lose game”, a statement I very much agree with (thanks to @twm88 for that). While a win is certainly desired (when is it not?) a draw would do fine. A loss on the other hand would make it three in a row and a meagre four points in seven games - not a good confidence boost before the Man City game next weekend. In fact, Swansea don't have the easiest set of games in the coming weeks with an away trip to Fulham, followed by Everton (home) and Spurs (away) soon after. You can see why it could be seen as a must-win game to some. The good news for Swansea is Michel Vorm is likely to be back between the posts. Unfortunately Gerhard Tremmel - despite the polite words from the team - played a big part in the Stoke loss. He didn't ooze confidence during that 90 minutes. I'm aware he was called in at short notice, but a second keeper is probably the most likely reserve to be needed at short notice. It's a little bit 'Catch-22' - he needs more game time for confidence, but the game time he gets is not boosting his confidence (for the record, I haven't read 'Catch-22' so I may or may not know what I am talking about). A regrettable loss is Kemy Agustien - out again following ankle surgery, which is something likely to keep him sidelined for a few weeks. Elsewhere Joe Allen and Ashley Williams should both feature after playing in the Wales international on Wednesday. The Swans set-up should be similar to that against Stoke, though I'd still like to see Routledge start and Sinclair come on later. Saturday's game will be refereed by Andre Marriner. I found this article on a Wigan fan site outlining why he is likely to be booed by the Latics fans. Makes interesting side-reading. As for bets this week I am holding off on any correct score prediction as my last few have been well off the mark and I don't want anyone to follow my lame guesses and waste money (like I do). However, Swansea to win the match is 2/1 (PaddyPower) and I think that is one bet my money will be on this Saturday afternoon. So, while it's not officially a must-win game, let's hope for it. Otherwise things start getting a little uncomfortable. Also - it'll be nice to get one up on Martinez!